The classic bouquet garni recipe is a powerful flavour building tool. It’s a quick and easy way to add dimension and depth to casseroles, stews, slow-cooker dishes, crock-pots, potjiekos, soups, and my personal favourite – oven baked vegetables. And you only need three herbs to make the classic recipe… parsley, thyme and bay. To put a modern twist on the classic bouquet garni recipe add a twig of rosemary, a stick of celery or a little slice of lemon peel. Fennel leaves will also liven up the taste. You don’t need to add all of these. Use what you have on hand. 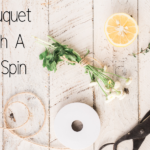 Start with the classic bouquet garni recipe for inspiration. Your aim in making any herb blend should be to produce a balanced, complex flavour that makes your diner want to take another bite, not analyse it. In other words – don’t overpower your dish with the bouquet garni. Bay leaf, parsley and thyme wrapped in an outer piece of leek. Oregano, bay leaf, garlic, and a strip of orange peel. Thyme, savory, marjoram, and a little hyssop. Parsley, tarragon, thyme, and a strip of lemon peel. Fennel, bay, and lemon thyme. Dill, parsley, green onion, and lemon balm. Lemon balm, marjoram, mint, and celery. Rosemary, myrtle, and a strip of orange peel. Parsley, juniper berries, thyme, and bay. Rosemary, garlic, oregano or marjoram, and thyme. Lemon thyme, mint and parsley. Sage, celery, parsley, and thyme. Lemon thyme, tarragon and bay. Parsley, bay, tarragon, and bruised lemon grass. Lemon thyme, lovage, parsley, and an outer piece of leek. Oregano, thyme, parsley and sage. Celery, savory, tarragon, and parsley. Bay, lovage, rosemary, and marjoram. When using fresh herbs to make a bouquet garni, exact measurements are not that critical - trust your instinct. Bruise the herbs slightly just before adding your dish to release more flavours. You can tie up the fresh herbs into a small bunch. We prefer to chop them coarsely to release more flavour, and then put them into a muslin bag. You can also use a large tea infuser if you have one. 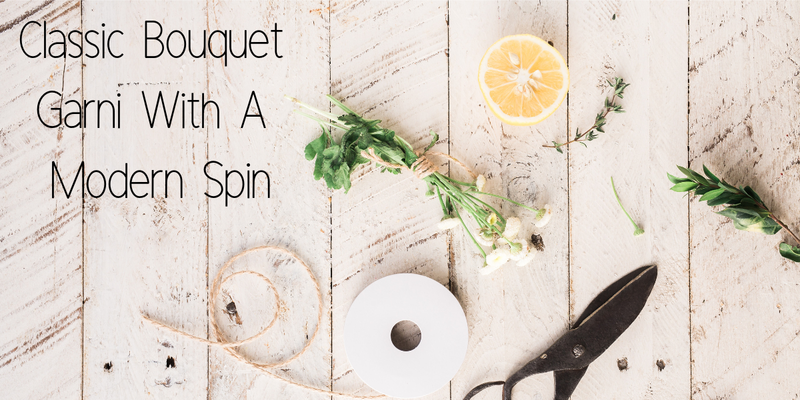 Add the bouquet garni to the dish right from the start to give the flavours time to marry. Remove the bouquet garni just before serving. This is to prevent your diners from discovering your flavouring secret. Just joking, but that's what the French used to do. We prefer to use fresh herbs, but dried herbs are just as successful. Use 1 heaped tablespoon dried parsley, 1 teaspoon dried thyme (we prefer a level tablespoon lemon thyme), 1 teaspoon dried rosemary and a single dried bay leaf. Tie up the dried herbs in a small bag sewn of muslin. Or grind the parsley, thyme and rosemary and add to the dish. Add the bay leaf, lemon peel, and celery stalk whole and remove before serving. Recipes and article by Di-Di Hoffman.